When a home is listed on the National Register of Historic Places, there are always great stories associated with it, and the current owner of this elegant Tudor Revival home says his chapter began with a phone call. The Maritz & Young classic was often unoccupied while the previous owner, a widowed friend, spent most of her time in her New York and Florida homes. “I had been in the house for dinner parties, and always liked it,” he explains. Seeing it unoccupied, he wondered if perhaps the owner might want to sell “someday,” so he gave her a call to express his interest. She was traveling, but just one week later they managed to connect. And with that, someday became moving day. Superbly framed by a deep arched doorway, an antique sideboard and Irish hunt table are the centerpieces of the formal dining room. While he made a few changes to the house in the beginning, it wasn’t until 2013— following a Valentine’s Day wedding— that he and his new bride began the transformation that would make the home their own, with the guidance and expertise of Colleen Ertl, senior designer and vice president of Diane Breckenridge Interiors. With perfectly proportioned rooms and a floor plan ideal for grand-scale entertaining, there was no need for structural modification. Like many talented artists, the designer began with paint, creating a warm canvas for the furnishings, rugs and artwork the couple had begun to collect. At one end of the living room, two spectacular gilded mirrors surround the arched doorway to the library, where leather armchairs and an array of pillows suggest a lazy afternoon with a good book. Serenity is assured with the “No TV in the library” rule, with the only soundtrack courtesy of an antique disc music box. Thoughtful architectural design keeps the wood-paneled room awash in natural light from two walls of windows. Respecting the light and the views, the designer dressed the windows with a simple Roman shade in a traditional plaid. A palette of creamy whites on walls and crown molding is continued into fabrics and trims, with soft blue upholstery on Queen Anne chairs, pillows and a tasseled ottoman. The creamy vanilla of the living room continues into the foyer, a sublime space featuring a broad staircase that splits at the landing, turning back and concluding in the second-floor sitting area. With a diamond-pattern terrazzo floor and soaring ceiling, the dramatic foyer recalls the elegance of a ballroom. When dinner beckons, the artistry continues in the formal dining room. Through a deep arched doorway, a stunning Irish hunt table provides seating for twelve— and perhaps the home’s best story. After purchasing the house, but before moving in, the homeowner was contemplating his new project and what it would require. At the top of the list? A round dining table. “A round table is so much better for conversation!” he says. And while it wouldn’t work in a long, rectangular room, he added, the square dimensions of his new dining room would be ideal. And so the search began. In New Orleans, the perfect piece was discovered through Bill Rau, the third-generation proprietor of renowned M.S. Rau Antiques. Once housed in an Irish castle, the table had a gracious but commanding presence. Knowing it was perfect, the homeowner didn’t hesitate. The dealer agreed to store it for several months, shipping it to St. Louis when the owner took possession of his new home, and a deal was made. But this was the spring of 2005, and the storage facility had the misfortune of being located in the path of Hurricane Katrina. When the antique sustained considerable water damage, Rau promptly refunded the entire price and had the damaged table shipped to Chicago for an intensive restoration. The table’s name describes its provenance as well as its occasion-specific function. The unusual design features a center portion that can be removed in two pieces, and servers used the semi-circles to carry and serve a traditional Pimm’s cup to riders gathered at the gate for a foxhunt. Back in the castle, the center opening allowed a server to pour wine and water with 360-degree efficiency. 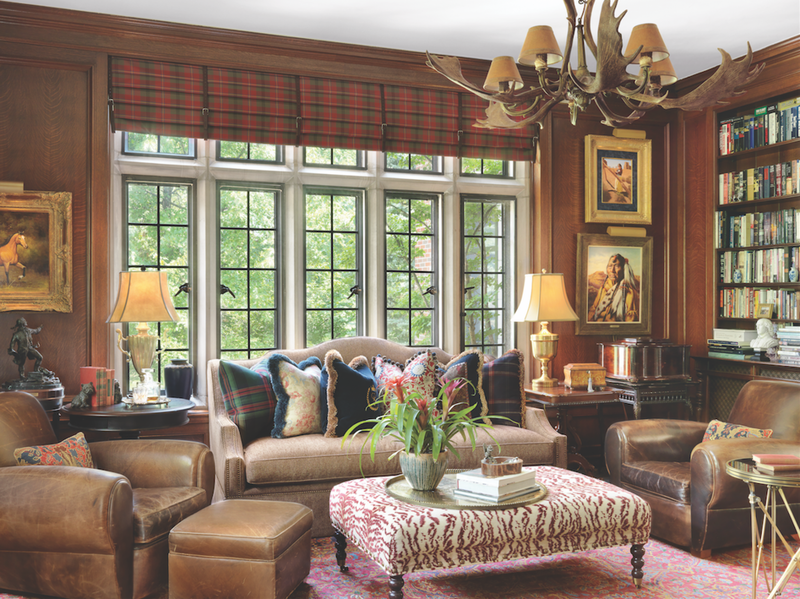 Leather and plaid bring traditional style to the wood-paneled library, awash in light from a wall of clerestory over casement windows. Enclosing the terrace created an all-season porch with wonderful views, as well as a “foundation” for the second-floor master dressing room. While the repurposed porch is versatile and cozy, its supporting role is arguably its most important. 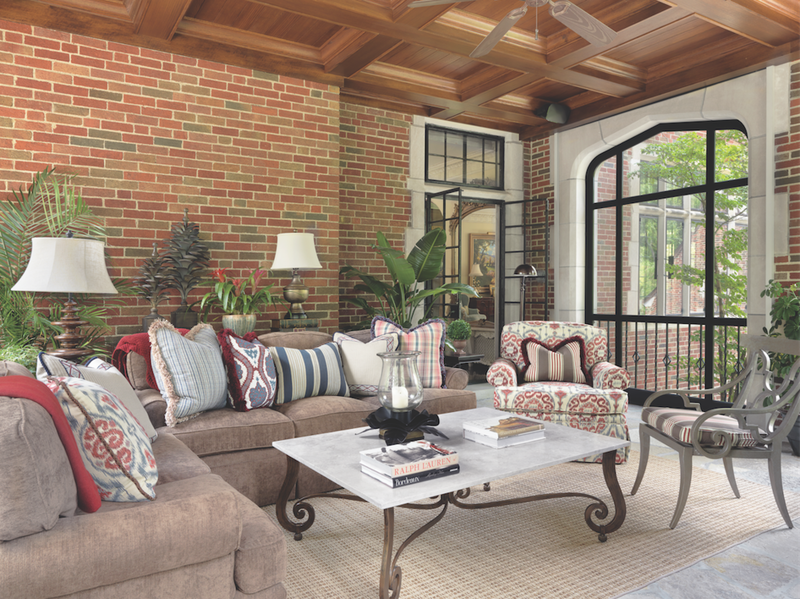 “Enclosing the porch gave us a foundation for the new second-floor master dressing room,” Ertl explains. 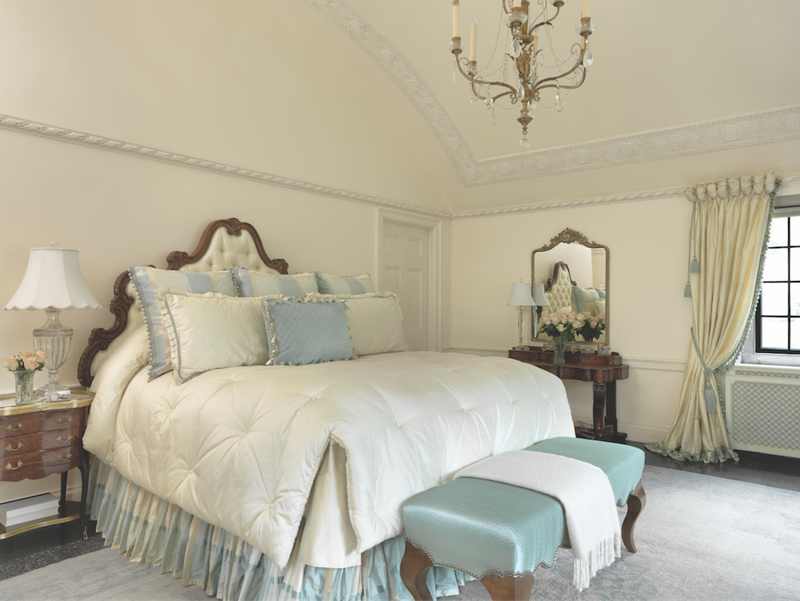 Outfitted with custom armoires, open shelving and a mirrored dressing table, the fabulously feminine room was created for the lady of the house at the request of her husband. “Yes, I take all of the credit, or the blame, for that idea,” he admits with a smile. In one corner, a small refrigerator is stocked with water, iced tea and the occasional adult beverage. Could there be a more enchanting place to get ready for date night? Bespoke linens, puddled draperies, and a richly padded headboard create a romantic ambience in the barrel-ceilinged master bedroom. The entire rear façade of the home is well connected to the outdoors, with an enclosed porch off of the library, and an additional terrace beyond, where winding brick staircases descend to the pool and gardens below. A flagstone path leads to the delightful and inviting peaked-roof pool house. Surrounded by a low stone wall and crafted in the style of the main house, the charming structure would be at home in the English countryside. An indoor and an outdoor fireplace share a single chimney, keeping things cozy in the cooler months. In summer, clematis vines cover the pergola, providing a shady spot for poolside dining, and privacy is assured by the densely wooded area at the back of the property. The pool house and infinity-edge pool were added in the homeowner’s first remodeling phase, replacing a putting green and sand trap. While she created the containers and hanging baskets herself (with some “heavy lifting” assistance from her conveniently tall husband), the homeowner says the overall landscape design and care is the work of Focal Pointe Outdoor Solutions. From the foyer, the main staircase splits at the landing, doubling back to a second-floor seating area, where an elegantly simple window treatment enhances the original casement windows.